Review Archos has embraced Android with the fervour of a kid in a sweet shop and is in the process of releasing a range of devices with screen sizes ranging from 2.8in - called the 28 - to 10.1in - called, yes you guessed it, the 101, all running Google's mobile OS. 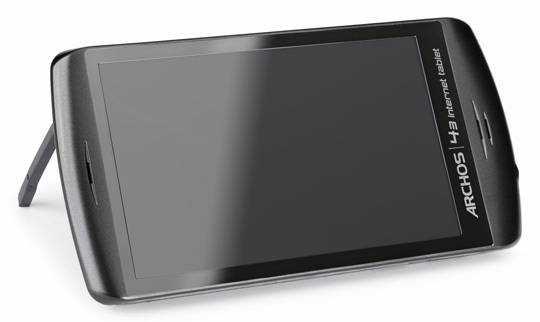 Archos' 43: Android tablet or PMP? The 28 and 32 are more pocket media players than tablets, while the 70 and 101 are more tablets than media players. However, slap-bang in the middle is the 43, which is a little of each. In short it's a device aimed squarely at the current big boy on the connected-PMP block, Apple’s iPod Touch. With its 4.3in screen the 43 is larger and heavier than the iPod Touch but not by much and with no hardware buttons on the fascia, Archos has managed to keep the bezel width to a minimum to deliver a device sleek and pocketable device. It's a solid and good looking bit of kit too, thanks to its rounded, gunmetal grey and partly stainless steel body. Usefully, Archos has fitted a stand at the back making the 43 resemble a half-scale Archos 5. The 43's internal spec is impressive and includes a 480 x 854, 16m colour LCD display, a 1GHz ARM Cortex CPU, 802.11b/g/n Wi-Fi, A2DP Bluetooth, 16GB of internal storage with a card slot for 32GB more and comprehensive codec support too, all tied together by Android 2.2, aka Froyo. Alongside the usual 3.5mm audio and micro USB data connectors, the 43 also has a mini HDMI port to connect it to a telly, but Archos doesn't supply a cable, alas. Invest in a micro USB adapter and the 43 will act as a host, allowing you to play or transfer content directly from USB storage. For wireless media access you get UPnP and Samba file share protocols. The touch screen is resistive rather than capacitive, but it’s a reasonable example of the breed and gives little away to the average capacitive panel with a quick double-tap zooming into web pages and images, in place of a pinch. 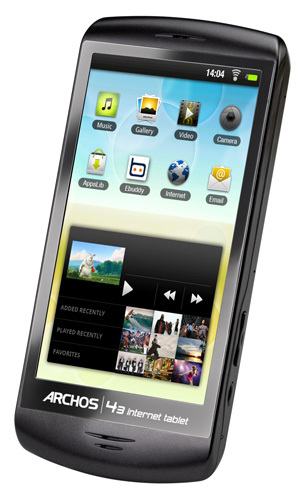 Visually, it is bright, crisp and colourful and upholds Archos’ established excellence in this area. A Touch Me in disguise?